Reishi mushrooms can be put in tea and soup, although they have a very bitter taste, but more commonly, reishi are grown for medicinal purposes. Typically, people purchase reishi growing kits. These kits must be left alone at room temperature for two to three days before beginning the growing process. While kits are the quickest and easiest way to grow the mushrooms, other methods to grow reishi are wood pulp and wood box cultivation. Buy the kit online (see Resouces) or from a health food store such as Whole Foods. Reishi mushrooms can also be prescribed by doctors and ordered by a pharmacy. Open the top of the mushroom kit bag and fill it with water. Allow it to soak overnight. Take the block out of the plastic wrapping of the mushroom kit and attach dowels around the top. The dowels will hold the plastic in a tent-like shape around the block, with one at the top, one in the middle and the other three around the outside. This will keep moisture inside the bag, which is important because reishi mushrooms require humidity to grow. Put the kit on a tray in a corner or under a florescent light in a basement, and spray the block lightly with water several times a day. This will ensure that the mushrooms are kept in a properly humidified habitat. Repeat the humidifying process every day and allow the mushrooms to grow for up to two months. 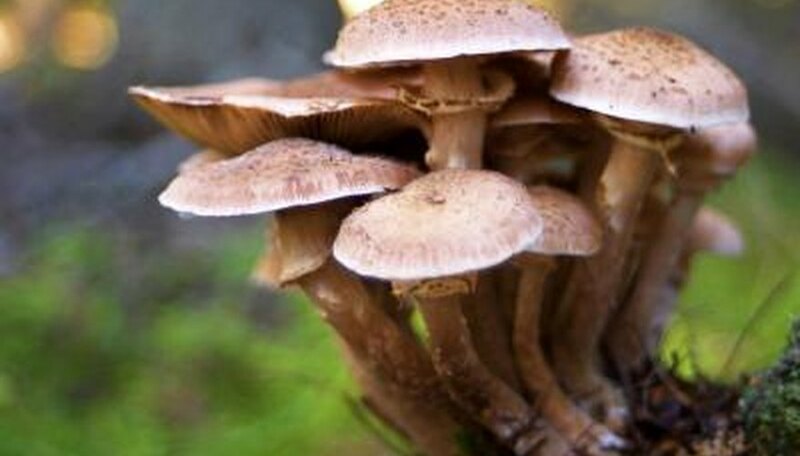 When the mushrooms have a light brown dust, they have matured and can be harvested for medical purposes or used as a soil conditioner. Put wood pulp and reishi fungus in a glass bottle (wood pulp cultivation method). Keep the bottle in a basement under a florescent light, and spray water in the bottle every day to keep the mushrooms moist. Put a small log with reishi fungus inside a wooden box. Keep the box in the basement. Every day spray with water to ensure the mushrooms will grow properly. This process will take about six months. Wiley, James. "How to Grow Reishi Mushrooms." Sciencing, https://sciencing.com/grow-reishi-mushrooms-6138889.html. 24 April 2017.